Last weekend was the Cambridge Lent Bumps Race. Oxford and Cambridge together are called “Oxbridge,” and both of them do these insane bumping races because the rivers where they row are too narrow for side-by-side racing. So instead of racing one at a time, which is boring, all the boats race at the same time, staggered along the river, and literally try to bump into the boats in front of them (thus, “bumps”). The reason its insane is that boats cost about £25,000 (or $40,000) and are fairly fragile. Every race does thousands of £s of damage. Here’s how it works: boats line up a boat-length apart along the river. 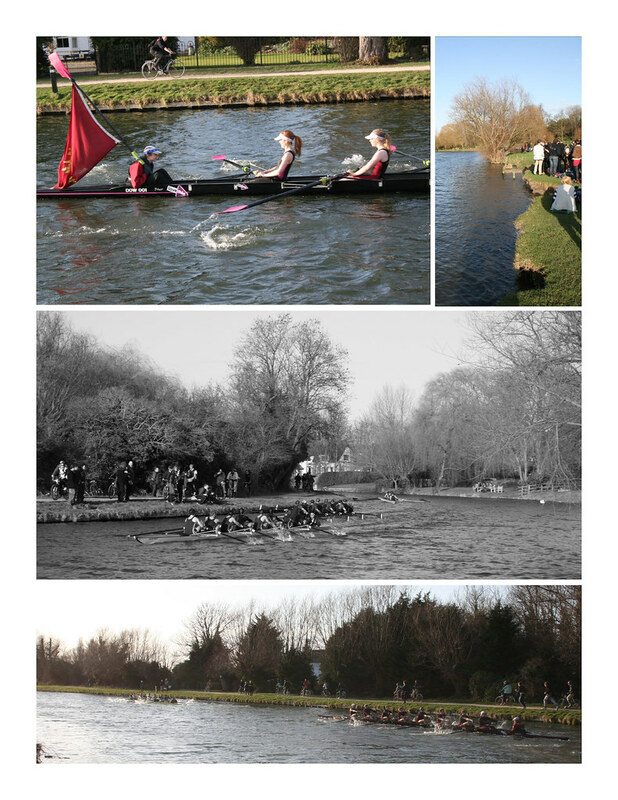 In Cambridge, they have a 2.6 km course; if they catch up to the boat in front of them and make physical contact, both boats drop out of the race and the two boats swap spots on the river The poor bastards behind them then have to catch up to a boat 4 lengths ahead of them while staying ahead of the boat behind them. Sometimes there are big traffic jams – three or four boats will all be about to bump and are all packed together. Or a coxswain will take a weird line to avoid being bumped and end up crashing or, at best, weaving all over the river. There are four days of racing (or rather, each boat races four times). Boats are lined up according to their place on the river, which carry over year to year. For example, there are seventeen boats in the first division (the seventeenth boat is also the first boat in the second division). If (for example) King’s College finishes in 9th place in 2012, then in Lent 2013 they will start in 9th place. Over the course of four days of racing, they could bump four times or get bumped four times. If they bump four times, then in 2014 they will end up 5th on the river and each member of the crew will get a customized, hand-painted oar to commemorate their achievement. Alternatively, if they get bumped every day, they will end up 13th on the river and bring shame and embarrassment to their college. Its “Oxbridge-y” because its so ridiculous and posh, and also because its such a big deal: a single college with 250 people might field five or six boats, which is a significant chunk of the college. And its so much fun to watch. Traditionally spectators and rowers alike drink a lot of Pimms, but it was too cold and too in the middle of the day so that will have to wait for the next round of bumps in June, when I plan to really commit to the day-drinking.